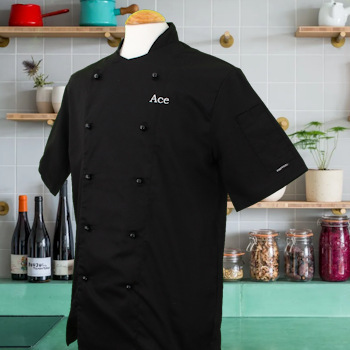 Personalised black chefs jacket with short sleeves and double-breasted stud style fastenings. Personalised black chefs jacket with short sleeves and double-breasted stud style fastenings. Quality made professional workwear 60% Cotton/ 40% Polyester. This commercial kitchen quality chefs jacket can be embroidered with your choice of text such as a name, job title or company name. The embroidery is to one side of the upper chest as worn, if additional bespoke embroidery is required we can quote to add motifs such as flags or company logos to the chest, sleeve or back of jacket if required. Please email us for bespoke logos. Please allow at least 2-3 days for this customised item to be dispatched. Size: X-Small 35-36 inch chest. Small 38-39 inch chest. Med 40-42 inch chest. Large 42-44 inch chest. XLrg 46-50 inch chest. XXLrg 52-54 inch chest.